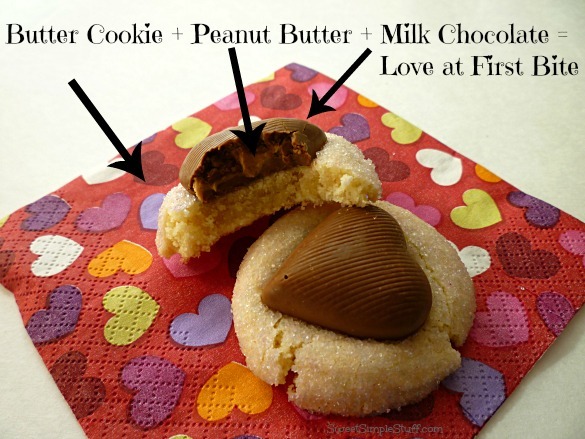 I’ve seen quite a few yummy peanut butter blossoms with chocolate hearts … just wanted to change it up a little … made a butter cookie and used three different varieties of chocolate! 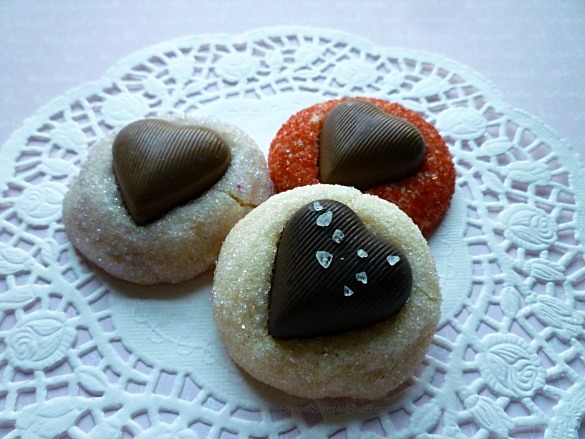 Note: I love the way the cookies with red sugar look … next time I would use a brighter pink and lavender sugar. Preheat oven to 350°F. Line baking sheets with parchment. 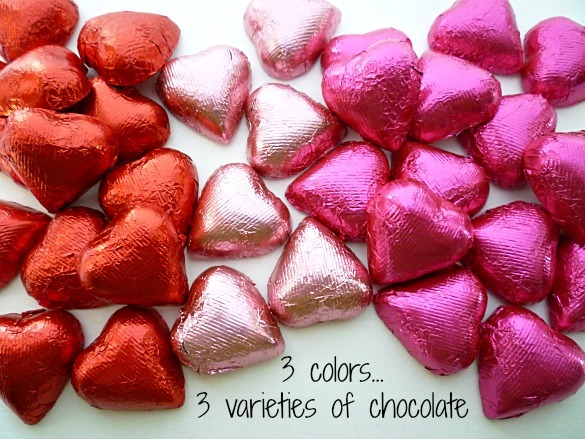 Remove foil from chocolate hearts. 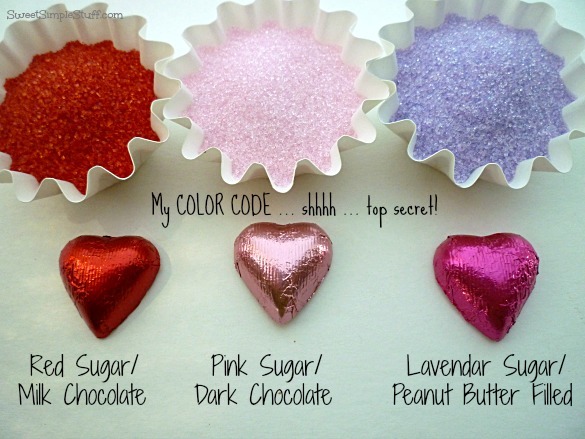 Roll dough into 1″ balls, cover balls with colored sugar and place on prepared baking sheets about 2″ apart. Bake 9-12 minutes. 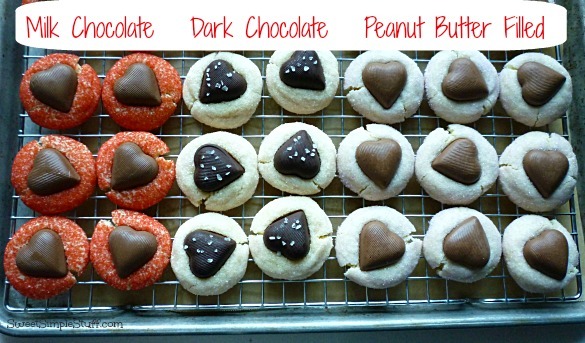 Remove cookies from oven, immediately gently push a chocolate heart into the center of each cookie. Let sit on baking sheet for a few minutes before removing to a cooling rack. Note: the chocolate may melt and become very soft and glossy, but it will hold it’s shape. Add sea salt at this point, if desired. Let cool completely and allow chocolate to firm up. Makes 30-36 cookies. 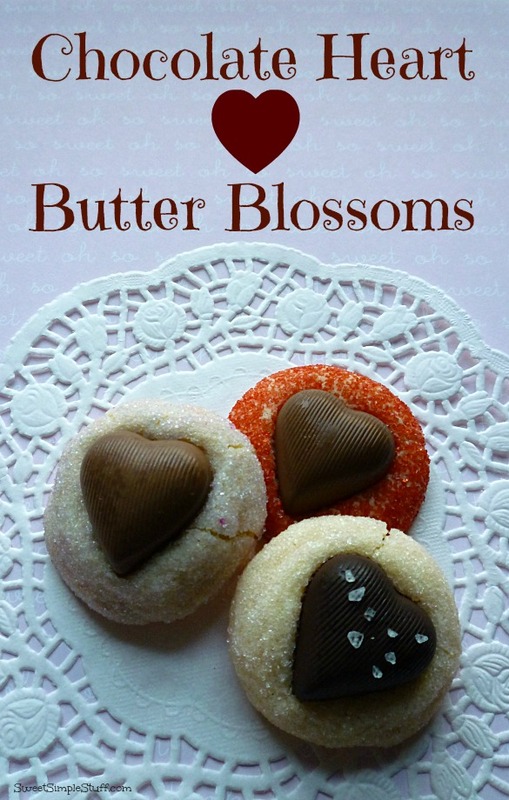 Make these Valentine cookies (sorry, don’t mean to sound so bossy) for family, friends, neighbors or that someone special … Chocolate Heart Butter Blossoms make people happy! My hubby, The Peanut Butter Man, loved them … even the ones without peanut butter! Thank you to SweetWorks for the chocolate hearts! Thank you Karene 🙂 I must agree with you! They look really awesome,but in the recipe you have sugar twice.Which one is the Flour? I am sorry if I sound out of place. Did you color your sugars, Brenda, or buy them that way? Your cookies look great and I’d like one of each, please! Well, better late then never for me getting my bum here. Thank you Colleen 😉 These cookies are seriously evil … mean that in the most delicious way! I could have used someone to tell me “step away from the cookies”, LOL! Thank you Jocelyn 😉 I like the look of the red, but the others tasted good too!